I love my 2006 Lexus GS 300, but one thing that always bothered me is that the car has bluetooth for handsfree calling but it does not allow you to use bluetooth for audio, meaning that I had a jungle of wires running across my car when I used to use tape to headphone jack kits to connect my iPhone 4s to my Lexus. Luckily I came across this post on the Lexus Forums that you can buy a device called the Vais SoundLinq2 aka Vaistech SL2Vi to connect your iPhone through a cable directly to your Lexus and retain your steering wheel controls to control your music as if you were using a disc changer! I told my wife about it and how much I wanted it but the only problem was the cost. So I made a few phone calls and got the original cost down a bit and before I knew it, my wife surprised me with the best birthday gift this year! 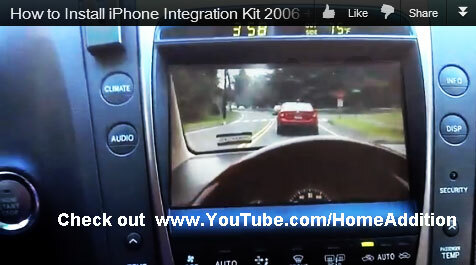 I created a complete installation video tutorial showing you just how easy it is to take your Lexus apart and install the iPhone Integration Kit by Vais or GTA. There's other videos out there but I took the liberty and 3 days of editing to provide you with the most thorough video installation guide out there. You can literally take my video into your car on an iPad or laptop and go along with every single step. Heck I even show you how easy it was to program the darn thing. All in all, I am extremely happy that I installed the Vaistech SL2Vi iPhone Integration Kit into my car because now I can play music and my audiophile ears are in pure ecstasy; especially when I'm playing recordings that are at a very high bit rate. Using the tape adapters or FM modulators to play music through the speakers in my Lexus sucked in comparison. In-fact, you cannot even compare the quality because they are worlds apart. The installation and taking your Lexus apart might scare you a bit at first but trust me, it is definitely worth it to install the iPhone Integration Kit if you like music. Heck if you want to play movies on your Lexus screen, that's another reason to install the Vaistech SL2Vi . Soon I'll be hacking my Lexus some more so that I can play videos even if the car is not in park. I bought my Lexus without the Mark Levinson system and that means I don't have navigation. So in addition to hacking my Lexus to Bypass the DVD parking brake signal, I will be Jailbreaking my iPhone 4s so that I can port the entire iPhone display directly to my Lexus screen. Why would I go through all the trouble of doing this? Simple... I can see my apps (like my navigation apps) on the Lexus screen once I'm done :) And if you subscribe to my YouTube channel and follow me some more, you will be able to do the same thing, because I try very hard to make my videos very easy to understand. So check out this 17 minute video that includes every single step of the installation that you need to know. Once you watch the video once, you will be able to grab a few tools and take care of this project yourself. And when you hear the sound quality for the first time, I guarantee that you will be just as happy as I am! show Apple Maps Navigation on the screen. 1st make sure you subscribe to my Youtube Channel, that way you'll get all the latest information on all my video postings. find out about it. I saved some guy over $13,000 in parts and labor on his 2006 Lexus GS300 that was out of warranty. To get the maps to work on the screen two things have to happen. 1. You have to Jailbreak your phone. I will be doing this soon, because I moved on to a Samsung Galaxy, so just stay tuned. 2. I have to bypass the parking brake wires on the back of the headunit. Otherwise you can never see the iPhone screen unless you put the parking brake on. Hello there, you make awesome videos! I wanted to ask when you will put up your video of how to show your iPhone on your Lexus screen. I have the same 2006 GS300 you do so would be fantastic to do and show Apple Maps Navigation on the screen. Thanks for any info.